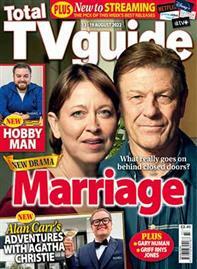 If you're a UK TV lover then our TV magazines is ideal for you. Total TV Guide has a separate magazine focusing purely on different sections of the UK; Total TV Guide England, Total TV Guide Scotland, Total TV Guide Ulster and Total TV Guide Wales and West. All feature easy-to-follow sections on; sports, drama, music, films, entertainment and lifestyle so you can enjoy what you want, when you want on your favourite digital and terrestrial TV channels. If you love a bit of telly and live in England, then our Total TV Guide is a must-have mag. Every week Total TV Guide is filled with the latest TV listings for the week ahead for both digital and terrestrial channels. If you love a bit of telly and live in Scotland, then our Total TV Guide is a must-have mag. Every week Total TV Guide is filled with the latest TV listings for the week ahead for both digital and terrestrial channels. If you love a bit of telly and live in Ulster, then our Total TV Guide is a must-have mag. Every week Total TV Guide is filled with the latest TV listings for the week ahead for both digital and terrestrial channels. If you love a bit of telly and live in Wales or the West, then our Total TV Guide is a must-have mag. Every week Total TV Guide is filled with the latest TV listings for the week ahead for both digital and terrestrial channels.